Welcome to the EnergyTools.com Web Site! We manufacture and distribute energy monitoring and software products for Energy and HVAC professionals. Attention: EnergyTools.com is no longer accepting orders. Existing customers can get support and replacement parts by e-mailing us at info@energytools.com. 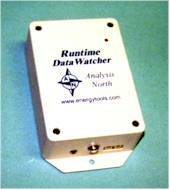 Brand Electronics Power Meters can be purchased directly from Brand Electronics. Sorry for the inconvenience. The EnergyTools.com Runtime DataWatcher datalogger records the runtime of fuel-fired heating systems, including hard-to-measure water heaters and millivolt heating systems. A separate sensor allows the unit to also log motors, air conditioners and other electrical appliances. Up to 22 months of data can be stored in the logger. All products carry a 14-day money-back guarantee! Check out our Free Energy and Indoor Air Quality Software available at this site. See the Contact Us page for info on how to reach us. Some documents on this site marked with the icon require the Adobe Acrobat Reader in order to view and print. Click the icon below to download a free copy of the reader.